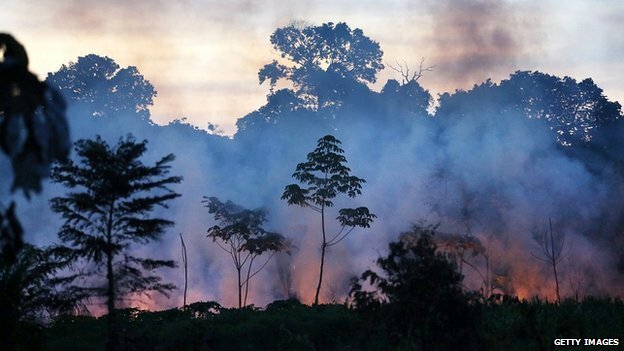 Nations meeting in Warsaw at UN talks have agreed a significant step forward towards curbing emissions from deforestation. A package of measures has been agreed here that will give "results-based" payments to developing nations that cut carbon by leaving trees standing. One observer told the BBC that this was the "signature achievement" of these talks. Deforestation accounts for about 20% of global emissions of carbon dioxide. Earlier this week the UK, US, Norway and Germany agreed a $280m package of finance that will be managed by the World Bank's BioCarbon fund to promote more sustainable use of land. Now negotiators have agreed a package of decisions that will reduce emissions from deforestation and forest degradation plus pro-forest acitivities (known as Redd+). The conference agreed a "results based" payments system that means that countries with forests will have to provide information on safeguards for local communities or biodiversity before they can receive any money. The delegates agreed to finalise the technical requirements and establish a process to allocate money. According to Paul Bledsoe, an energy research fellow at the German Marshall Fund, who is attending the talks, it is a significant step. "The ministers have been working for almost 10 years to finalise the rules which will allow donors to invest in forest management practices in the developing world and get a way to verify the emissions reductions," he said. "I think this agreement allowing for investments in forests in developing countries is probably the signature achievement of these talks." This view was echoed by Pipa Elias from the Union of Concerned Scientists. With the technical and financing decisions signed and sealed at today's plenary, the Redd+ house is built, though there will be a bit more work in terms of furnishing it. "The biggest issue is that developed countries still need to ante up the $20-$35bn a year necessary for a global Redd+ programme. But, in the meantime, developing countries can get started now. We couldn't be more thrilled with this outcome," she said.